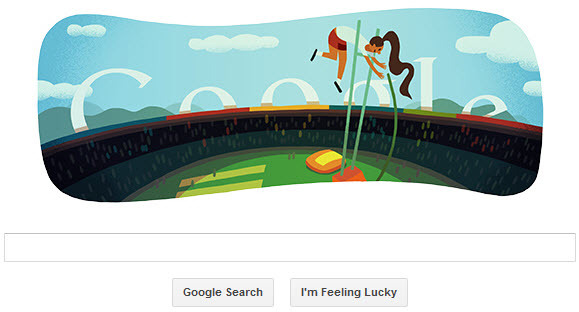 Google is celebrating 2012 london olympic with a new London 2012 Pole Vault doodle on its homepage. This google doodle shows a female pole vaulter trying to take a leap over the bar using a pole and the logo of Google is seen behind the stadium. Pole vaulting is a track and field event in which a person uses a long, flexible pole as an aid to leap over a bar. Pole jumping competitions were known to the ancient Greeks, Cretans and Celts. It has been a full medal event at the Olympic Games since 1896 for men and 2000 for women.